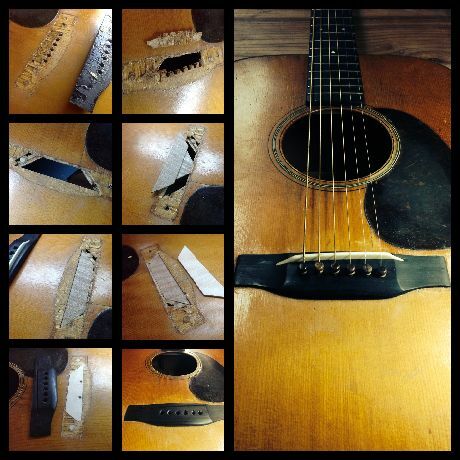 Fretted Strings is a full-service shop for all your repair needs. Throughout his decades of experience, Harrison has performed nearly every repair possible on all styles of acoustic and electric guitars, as well as on many other types of instruments. ethods to complete the job. With every repair, we do our utmost to provide a standard of impeccable quality, while working within the financial means of our customers. Please take advantage of our complimentary diagnosis for all instrument repairs. We will present all options and prices, as well as our recommendation, up front. Re-gluing loose braces, bridges, fingerboards, etc. 1943 Martin D-18: a unique pinplate, soundboard & bridge repair job.